Asteroid 2005 YU55 wasn’t my first visual observation of an asteroid passing near Earth, but preparing to view it brought back some great memories of our first one, asteroid 2002 NY40, nearly ten years ago. Here’s a little writeup about both observations. 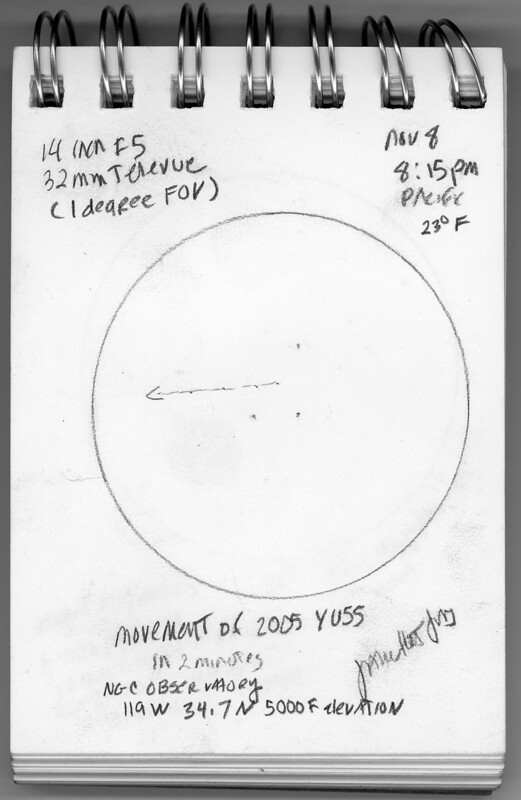 First up, Tuesday night’s observing of Asteroid 2005 YU55. It’s 400 meters (1,300 feet) in diameter. On November 8, 2011 it passed 0.85 lunar distances (324,600 kilometers or 201,700 miles) from the Earth. It has been studied by radar using NASA’s Deep Space Network’s Mars Antenna in California’s Mojave Desert. The Herschel Space Observatory took some measurements in the far-infrared. The Swift Telescope observed it, too. Oh, also legions of amateur astronomers imaged, sketched and observed this “once in-a lifetime” event, including me! Tuesday afternoon, I drove 100 miles to a friend’s private observatory near Mt. Pinos. I knew as soon as I looked at the sky that I’d never find the asteroid in my telescope. The near full moon wiped out all the fainter stars I’d need for star-hopping to the asteroid. It was 30°F upon arrival, snow on the ground, and it got colder as soon as the sun set – to a low of 23°F. 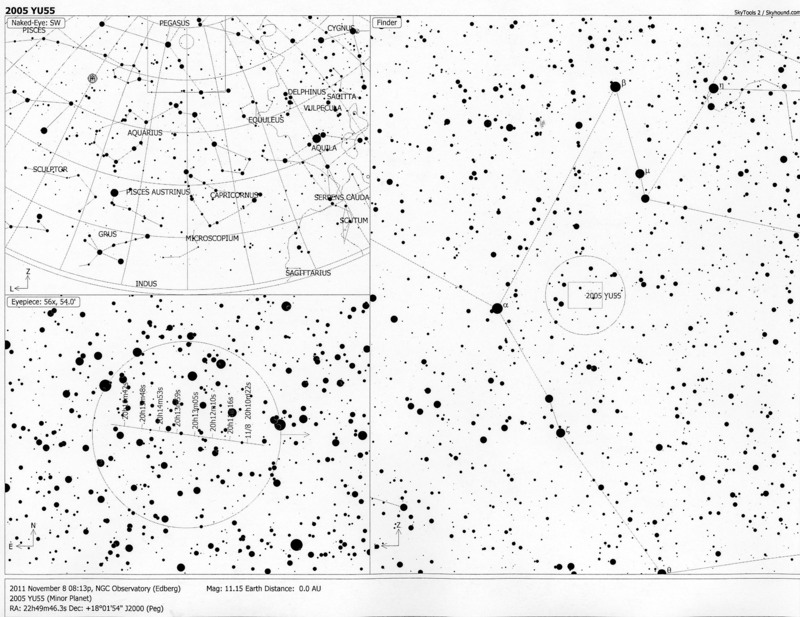 After an hour, Steve, the owner of the observatory found asteroid 2005 YU55. He was stunned at the movement as it zipped across the eyepiece view. Three of us took turns stepping up a ladder to reach the wide field eyepiece atop his 14-inch reflector. The 1 degree field of view in the eyepiece we used is equal the apparent diameter of two side-by-side full moons. We took turns watching the faint asteroid move for about a minute or two, then letting the next person have a look. It took the asteroid about 9 minutes to traverse the eyepiece field. My sketch shows the asteroid’s motion in about 2 minutes, and this star chart gives you an idea what the we saw in the sky and in the eyepiece. You can see the constellation Pegasus high overhead on the star chart. That’s where we were aiming. As we tried to follow the faint asteroid in the eyepiece, we each made a triangle out of slightly (magnitude 9 and 10) brighter stars which the 11th magnitude asteroid would pass by. That way we had fixed objects to anchor our view of the motion. This was no glittering diamonds on black velvet view. The nearly full moon was right next to where we were looking, and it brightened the sky and the ground. Only the brightest stars were visible. “It was a fast-moving ghost against other fixed ghosts in the moonlit background sky”, described Steve. I saw a grey poppy seed moving against a grey felt sky. It made us gasp in amazement that we were looking at it with our own eyes, especially since it was so small and so faint! After an hour or so of viewing, we packed up and headed back home, 100 miles away. Now, here’s a little trip down memory lane for me – my first asteroid flyby on August 17, 2002. On August 17 and 18, 2002, Asteroid 2002 NY40 zipped past Earth 1.3 lunar distances – 530,000 kilometers or 330,000 miles away. From 9:30 to 10:30 p.m. on August 17th our deck in suburban San Rafael, CA was filled with telescopes. We invited astro friends over for a spur-of-the-moment asteroid party, gambling that our inland location would be fog-free, unlike many of the usual astro spots. After a quick dinner, a dozen of us stepped out on the deck. Mojo was the first to spot the swift 9th magnitude asteroid 2002 NY40 in his 14.5-inch f/4.8 LITEBOX reflector. Our friend Jim also found it in his 8-inch LX-10. Our friend Stacy was happy to spot the moon in her new 10-inch dob without a finder. For a good hour we kept the asteroid in Mojo’s scope. All our pals got to see the asteroid whiz through the field of view several times through two telescopes. Both observations were amazing. You can always go back and look at videos and images, but you only get one chance to see celestial events like these with your own eyes. And I plan to try and observe every once-in-a-lifetime event that I can.